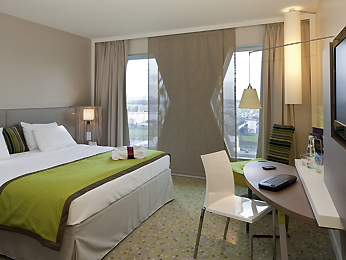 The 4-star Mercure Paris Orly Rungis hotel is located 5 min from Orly airport and 15 min from central Paris. The hotel is accessible from Orly airport by a free shuttle bus. Generous buffet breakfast with a panoramic view of Paris. Ideal for leisure stays and business trips, the Mercure Paris Orly Rungis hotel has 28 spacious and renovated meeting rooms. Fitness room, restaurant, private parking and free WIFI are also available to you. The Mercure Paris Orly Rungis and its staff have gained a lot of experience with arranging meetings, conferences, trainings and all sorts of events. Offering conference facilities including 28 meeting rooms the hotel has been used as a conference hotel in Paris on a regular basis. Please also have a look at the other conference hotels in Paris which we are proud to present to you.